Every site needs to get ranked in search engines, but before that a website must first get indexed in search results. Search engines are smarter and they crawl your site once it is live. Still many new sites struggle to get indexed. To get faster and better index your site you must submit your URL to Google, Bing, and Yahoo. Submit your site to Google and it crawls and adds new site to index and also updates existing sites. So if you have any new blog posts that are not listed in Google then you can submit your URL to Google. 2- Login with your Gmail account and add your homepage URL, enter CAPTCHA and click "Submit request". Now your request will be processed and your site gets indexed shortly in Google search results. Note: Only submit top level directories that is your homepage (http://sharetoworld.com) and Google crawls the rest of your pages. The process is same for what you done for Google. Go to Bing site submit and add your homepage URL (http://www.sharetoworld.com/), enter CAPTCHA and Submit your site. 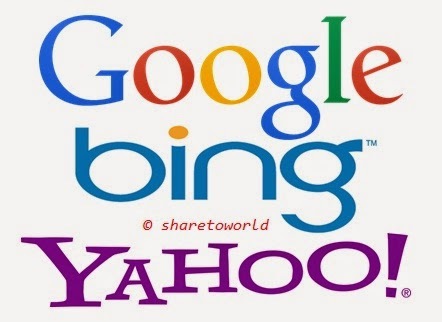 Now your site will be soon include to Bing. Go to Yahoo site submit Yahoo site submit and click "Submit Your Site for Free". It will take you to Bing webmaster tools. Login with your Microsoft account and on the middle side in dashboard click "ADD YOUR SITE"
This is how you submit your URL to Google, Bing, and Yahoo. Be patient and your site will be soon added to index. Don't spam and submit your site using any automated software. Don't forget to share this post by clicking the sharing buttons below.